Evgeni Malkin has been the talk of the town in Pittsburgh since reaching the 1,000-point marker with two assists in a 5-3 win over the Washington Capitals on Mar. 12. However, Malkin is just one of seven Pittsburgh Penguins players to reach career milestones this March, and one of 13 players and a general manager that could potentially add accolades to their resumes before the final game of the regular season on Apr. 6. Take a look back at the Penguins’ March milestones and which players to watch as the 2018-19 regular season comes to a close. 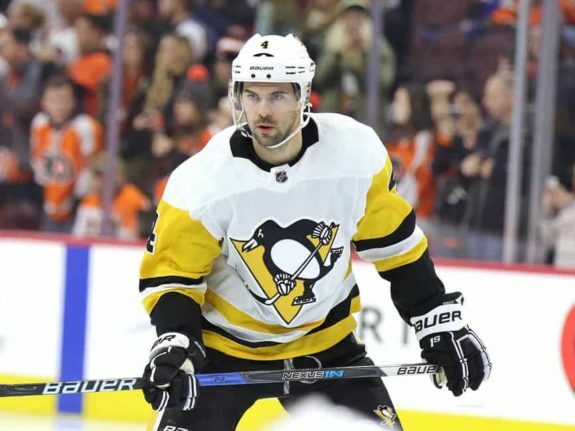 When 24-year-old Dominik Simon stepped onto the ice for a St. Patrick’s Day battle against the Philadelphia Flyers he did so for the 100th time in his four-season career with the Penguins. After playing just three and two games, respectively, in his first two seasons, he became a regular call-up in 2017-18, and a roster mainstay this season, missing just eight games in December due to a lower-body injury, and three games in February where he was a healthy scratch. “He makes the game easy for you. 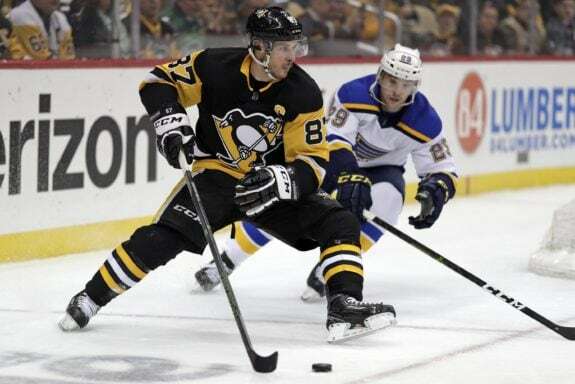 I really like playing with him,” (from ‘Back on the top line, Dominik Simon looking to click again with Sidney Crosby,’ Pittsburgh Post-Gazette – 1/28/19). Phil Kessel’s third-period power-play goal against the Washington Capitals on Mar. 12 did more than give the Penguins a 4-2 lead and help Malkin tally his 1,000th career point. It also helped 28-year-old defenseman Justin Schultz reach the 200-point plateau. With all the excitement surrounding Malkin’s milestone, Schultz’s accomplishment took a backseat but it is still impressive nonetheless. Schultz acquired his 200 points in seven seasons – 424 games – with the Edmonton Oilers and the Penguins. Schultz grabbed his 200th point less than a month after returning to the lineup. He missed 53 games from October to February due to a leg fracture. With the way Nick Bjugstad and Jared McCann have been meshing and producing with the Penguins, it’s easy to forget they’ve only been members of the team for less than two months. McCann has put up 13 points in 22 games with the Penguins, and Bjugstad has tallied 10 in the same amount of time, one of which was a goal that pushed his career point total to 200. The milestone goal came midway through the third period of the Mar. 14 matchup against the Buffalo Sabres to put the Penguins up 4-0 in an eventual 5-0 victory. Bjugstad also had an assist on Jake Guentzel’s late third-period power-play goal to boost his career point total to 201. Prior to joining the Penguins, Bjugstad spent six seasons with the Florida Panthers, the team with which he acquired 191 of his 201 points. Patric Hornqvist opened the month of milestones by stepping onto the ice at KeyBank Center in Buffalo on Mar. 1 for a game against the Sabres. Hornqvist did more than just skate in his 700th career game. He also netted his 16th goal of the season, a power-play marker, to tie the game at two. Hornqvist has played 11 seasons in the NHL, six with the Nashville Predators and five with the Penguins. 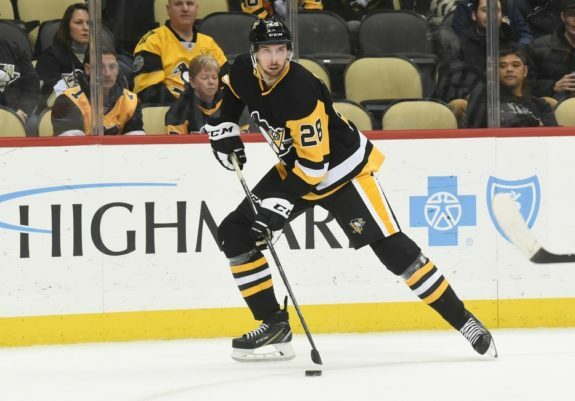 He is also a two-time Stanley Cup champion and even scored the game-winning goal in game six of the 2017 Stanley Cup Final to help the Penguins push past his former team to claim their second back-to-back Cup victory. With two assists in the Mar. 12 victory over the Washington Capitals – the second of which came on a Phil Kessel goal that also spawned Schultz’s 200th career point – Malkin became the fifth Russian-born player, the seventh player as a member of the Penguins’ organization, and the 88th player in NHL history to hit the 1,000-point milestone. There are only five active NHL players with 1,000 points: Joe Thornton of the San Jose Sharks, Alex Ovechkin of the Capitals, Patrick Marleau of the Toronto Maple Leafs, Malkin, and teammate Sidney Crosby. Speaking of Crosby, he achieved a milestone of his own just a week prior to Malkin in a 3-2 overtime win against the Florida Panthers on Mar. 5. An assist on Jake Guentzel’s goal just 16 seconds into the second period was enough for 1,200 points but in typical fashion, Crosby went above and beyond expectations. He scored a power-play goal midway through the second period and assisted on Guentzel’s overtime game-winning goal for 1,202 career points by the end of the night. 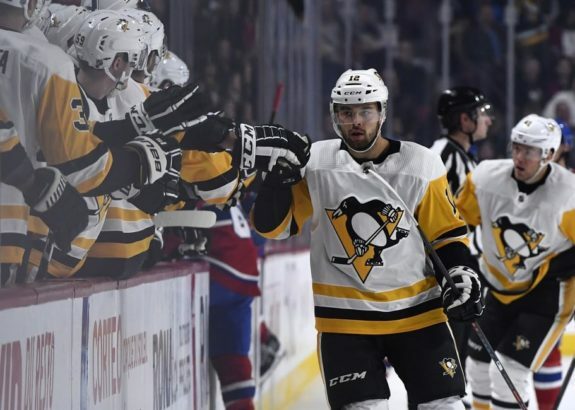 The Penguins joined the Detroit Red Wings, Boston Bruins, and Montreal Canadiens, and became the fourth team in NHL history to have at least two players record 1,200 or more points as a member of that club. Mario Lemieux is the only other Penguin to reach this milestone. 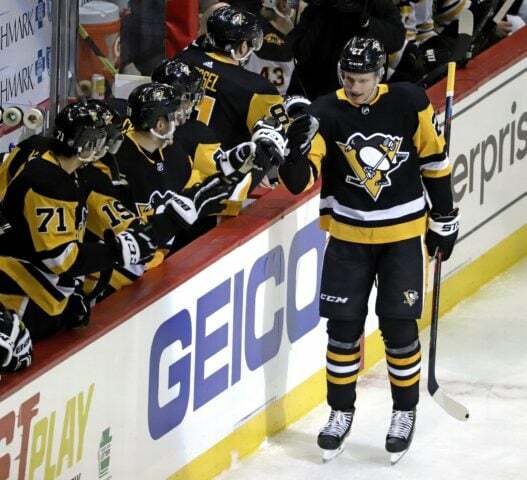 With his goal in the same game, Crosby also reached the 30 goal plateau for the ninth time in his career. 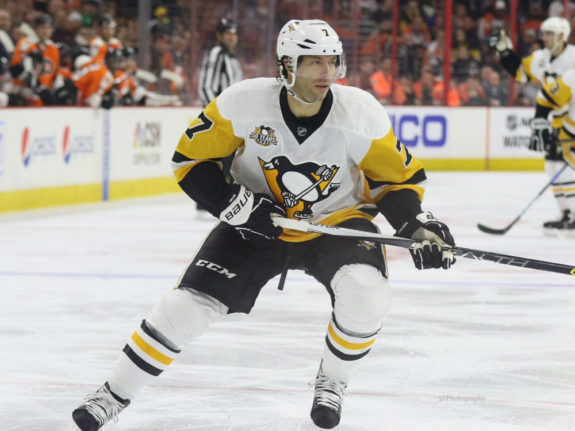 There’s a reason the Penguins players and fans have taken to calling Matt Cullen “Dad.” He’s been around the league for a while, since Oct. 28, 1997, to be exact, when he played his first NHL game as a member of the Mighty Ducks of Anaheim. Marcus Petterson and Jared McCann were both just a year old when Cullen broke into the NHL, but they were on hand to witness a milestone for his personal resume on Mar. 5 when he laced up the skates for his 1,500 career game against the Florida Panthers, one of his former teams, which coincidentally took place on ‘90s theme night at PPG Paints Arena. Cullen has played 21 NHL seasons for 18 coaches and eight teams, including the Ducks, Panthers, Carolina Hurricanes, New York Rangers, Ottawa Senators, Minnesota Wild, Nashville Predators, and Penguins. He has won three Stanley Cups, one with the Hurricanes in 2006, and two with the Penguins in 2016 and 2017. With the 1,500 game marker, Cullen has played more game than any other member of the 1996 Draft Class, and he has played the second-most games of any American-born player, behind Chris Chelios, who played 1,651 games in his career. Cullen is also ranked 20th on the All-Time NHL Games Played list. Barring an injury or illness, he will surpass Steve Yzerman for the 19th spot on Apr. 4 against the Detroit Red Wings with his 1,515th career game. 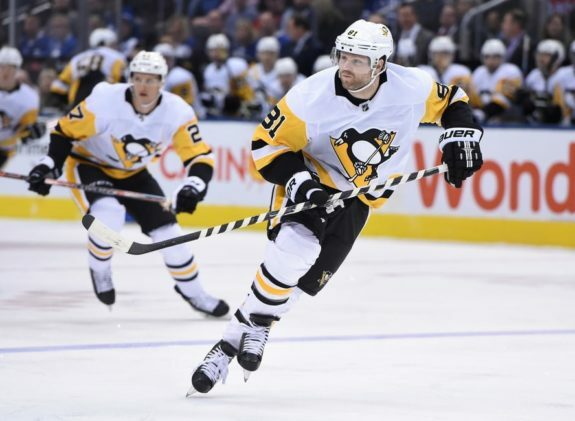 With just nine games left in the regular season, keep an eye on these Penguins who could reach new milestones before the postseason. If Pettersson stays healthy, he will play his 100th career game on Mar. 23 against the Dallas Stars. He will achieve this goal in just three NHL seasons as a member of the Ducks and the Penguins. Bjugstad needs just seven goals to hit the 100-career-goals plateau. A few spectacular performances or even a one-goal-per-game streak could make this milestone a reality by Apr. 6. Though Matt Murray is unlikely to play or win all of the remaining nine games in the regular season, he is just eight wins away from 100 in his career. If he could reach this milestone, it would be a confidence builder for Murray himself and the team as a whole heading into the playoffs. 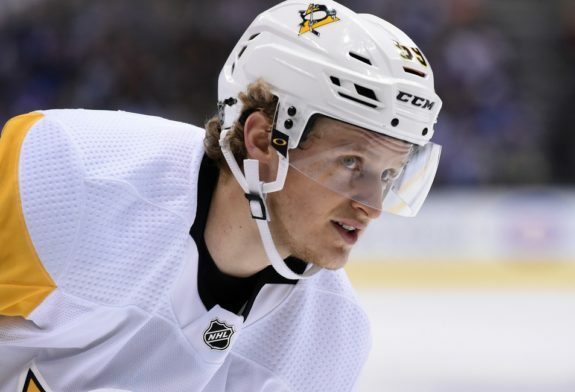 If Jake Guentzel remains healthy, he will play his 200th career game on Mar. 29 against the Nashville Predators. He can also complete his second consecutive full season with the Penguins by playing in the last nine games. Additionally, Guentzel is just one point away from tallying 150 in his three-year career, a milestone that he is likely to hit before Apr. 6. Though not known for his scoring ability, defenseman Jack Johnson is just nine points away from tallying 300 in his 13-season career with the Los Angeles Kings, Columbus Blue Jackets, and Penguins. 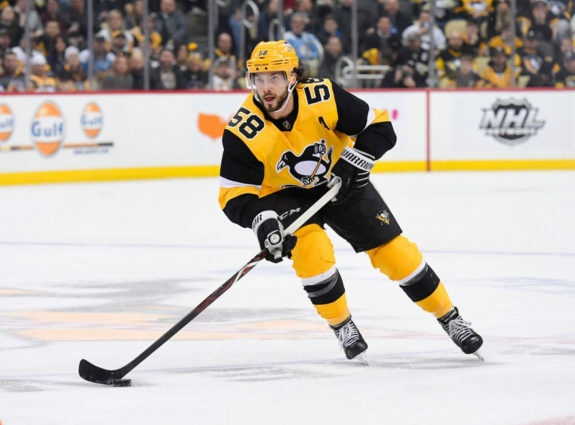 While it is more likely Johnson will complete this task sometime next season, it is not impossible for him to accumulate nine points in nine remaining games. Phil Kessel has played 764 consecutive games in his career and has the 8th longest streak in NHL history. That adds up to over nine consecutive full seasons of hockey, not including the playoffs. Of those 764 games, Kessel has played 319 of them with the Penguins, tying Craig Adams for the longest consecutive game streak in team history. If he does not come down with an illness or injury before the Mar. 19 game against the Hurricanes he will set a new Penguins record when the puck drops that night. As if the 2018-19 season hasn’t already been memorable for Malkin, he could add another accolade to his resume before the playoffs: 400 career goals. He has to light the lamp nine more times to reach the milestone but is now listed as being out week-to-week with an upper-body injury. If his status stays that way, 400 career goals might become one of his first accomplishments of the 2019-20 season. Kris Letang could reach 500 career points with 10 goals, 10 assists, or a combination of the two. However, he first has to get healthy and return to the lineup. If he returns within the next few games, he could reach this milestone before the end of the season, though he’ll have time working against him, and will have to perform at a high caliber to get the job done. Players aren’t the only members of an organization who can hit milestones. 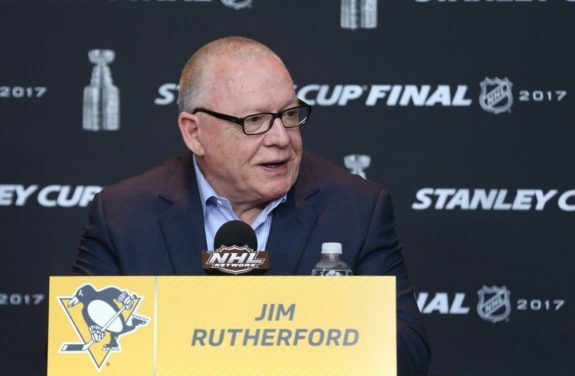 Jim Rutherford will become the fourth GM in NHL history to have been at the helm for 1,900 games when the Penguins play their last game of the season on Apr. 6 against the Rangers. Rutherford was the general manager of the Hartford Whalers from 1994-97 before the team relocated to North Carolina. He stayed with the franchise as general manager of the Hurricanes from 1997 to 2014 and then moved to his current position with the Penguins in 2014. He has won three Stanley Cups – one with the Hurricanes in 2006 and two with the Penguins in 2016 and 2017 – as a GM. The milestones don’t have to stop at the end of the regular season. The Penguins also currently hold the longest active post-season appearance streak, having not missed the playoffs in 12 seasons, since 2005-06. But with the Metropolitan Division standings so tight, they are just a few bad games and four or five points away from being out of the playoff picture and seeing that streak come to an end.